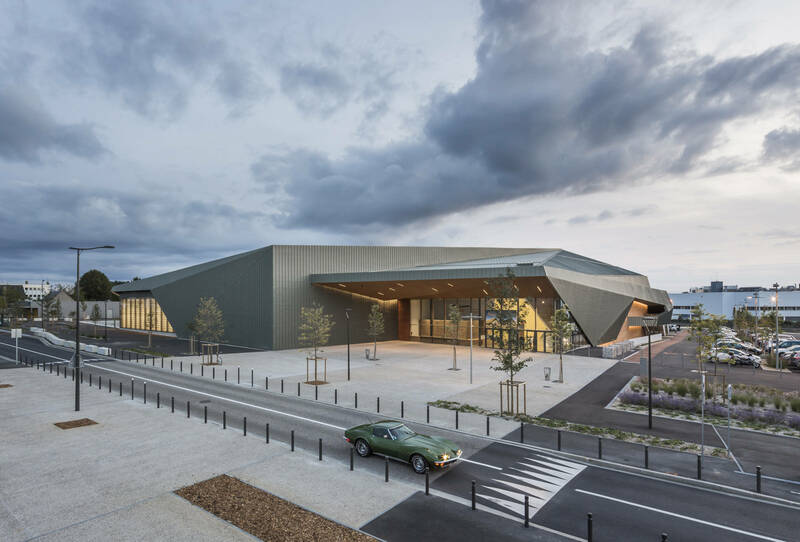 With its nervous and incisive architecture, its identifiable envelope, its generous interior spaces, the Jeu de Paume Hall is a high-performance cultural and sport equipment, by its functionality as much as by its image. Its architecture contributes to its evidence and appropriation, with its apparent formal simplicity, its expression and its materials, which define the right tone for this public equipment which asserts itself as emblem of the new eco-district. Composed of two large volumes (main hall and annexe), the Jeu de Paume is unitary, and affirms a contrast between exterior and interior: its angular and dynamic metallic envelope offers a resolutely contemporary image, skilfully interacting with its urban context. Its volumes, folded and nervous, recall the roofs of slates of the region, with the edges drawn and the colors changing. Requiring minimal maintenance, it is distinguished without being ostentatious. Inside, its warm and natural design is harmonized by the use of wood.